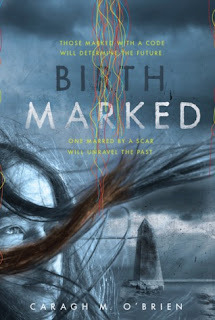 I've had Birthmarked on my TBR list for a while now, but it wasn't until I was lucky enough to receive an ARC of Promised (Birthmarked #3) that I got around to reading Birthmarked. I was a little leery of accepting a review request for a third-in-the-trilogy book when I hadn't read the first two books, but I was hopeful that my library would have the first two books. No such luck. Catching up on the series (buying the first two books) has now cost me about $22. But, if book two, Prized, is anywhere nearly as good as book one was, I'll be a happy camper. Because I loved Birthmarked! I sped through this book, in awe of how good it was and fast the story moved. It's rare that I like a third-person narrative as much as I liked Birthmarked. O'Brien continually surprised me with her plot twists, which I loved. Each new revelation brought another level of intrigue to the story, which made the book so dang interesting. The characters were so well-developed, even the minor characters. Each character brought something to the story---there was no extraneous fluff in Birthmarked. O'Brien manages to create a unique and totally believable world without a lot of draggy world-building at the beginning of the novel. I'm so glad that I didn't read any reviews of Birthmarked before I started the book. I went into it with a clean mental slate, so to speak, and I was able to form my own opinions without being influenced by other reviewer's thoughts. I loved Birthmarked, loved everything about it. It really stands out in the genre, and I cannot wait to start book two, Prized.